D ue to the high level of variability in diamond solitaires, you must choose a trusted local jeweler from whom you should purchase your diamond engagement ring (we have identified a trusted local jeweler and they are listed in the right column of this page). It is ridiculous to buy your diamond ring from someone that you found on the Internet. Many times they send you something that isn’t quite what you ordered, and then when you complain they claim that you switched the diamond and are trying to scam them. 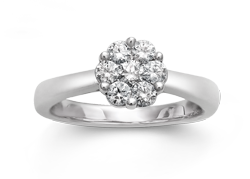 It is extremely difficult to plead your case when dealing with an Internet diamond seller. By choosing a trusted local jeweler, you get to meet face to face. That jeweler can show you your diamond under a microscope so that when you buy your diamond engagement ring, you know exactly what your diamond’s 4Cs are. Even diamonds that are graded by a national grading laboratory that have the same classification can be different. Why is that? Well, when a national laboratory ranks the inclusions (imperfections) in a diamond, they just do a true grading of how sever the inclusions are. They don’t take into account where the inclusion is in the diamond. A diamond with an inclusion off to the side that can be placed under a prong has a higher value than a diamond with the same size inclusion that is right in the middle of the diamond. Also, a diamond with a dark inclusion is less valuable than one with a clear inclusion. When buying diamond rings — use a local jeweler. They have typically been around for decades and generations. They have a reputation to uphold. The jeweler will see you in public and have to look you in the eye — something they won’t be able to do if they don’t give you a fair deal when you are buying your diamond engagement ring. They know the local diamond market and can determine the true value of your diamond.